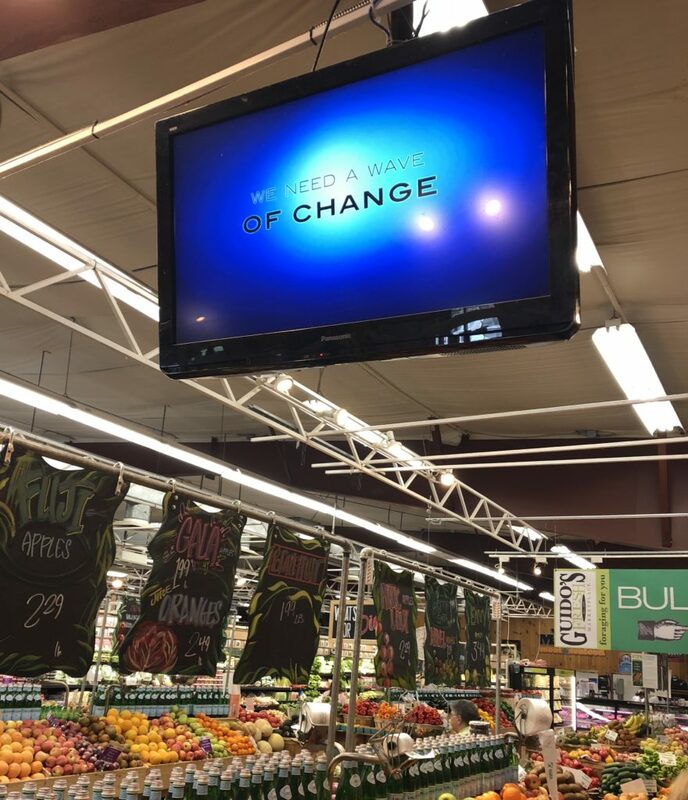 The large video screen at the entrance to Guido's Fresh Marketplace that displays the message, 'We need a wave of change,' and plays the documentary 'A Plastic Ocean' depicting the huge floating plastic bottle dump covering thousands of acres of the Pacific Ocean. Great Barrington — As the town prepares to implement its decision to ban the sale of small single-use plastic water bottles — despite a last-minute attempt to thwart the initiative that had been adopted at the May Annual Town Meeting — some local businesses are embracing the embargo by installing water refill stations where customers can fill up their reusable water bottles. Still, he added, it will take a while to recalibrate our reliance upon plastic service items. Adam Sugarman, customer services manager at the Berkshire Co-op Market agrees that the ban is just a start. “The Berkshire Co-op has offered a refillable water station for over a decade, because there was a demand for people to have access to water they can trust. 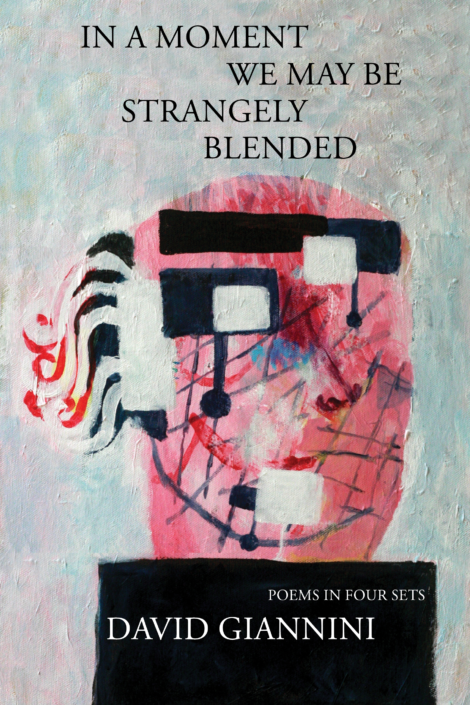 It’s almost like a gesture,” Sugarman said. 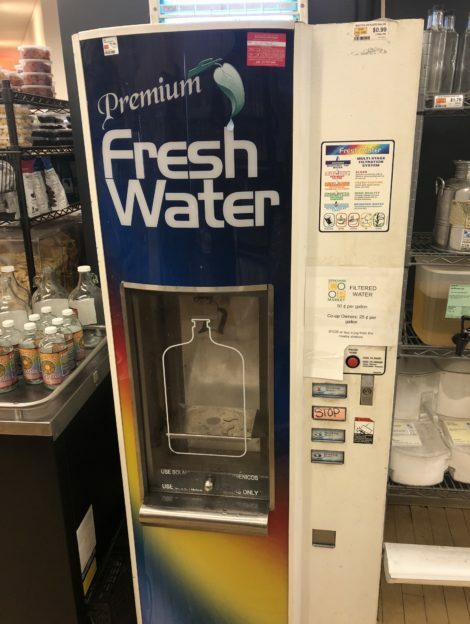 And although located in a passageway in the back of the store and a refill that costs 50 cents (25 cents for Co-op members), the Co-op’s water station has been a very popular service, he said. “We have a lot of people who have been bringing glass jugs, plastic jugs, whatever jugs they care to bring to fill up with clean water rather than drink their tapwater at home or buy bottled water,” Sugarman noted. 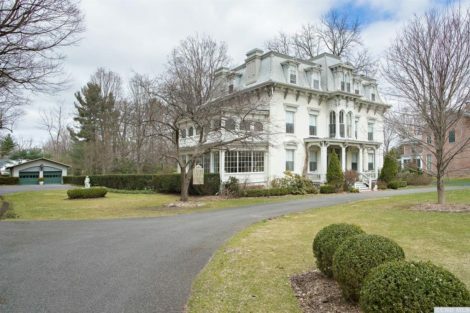 The Berkshire Co-op prides itself in pursuing environment-friendly alternatives, he added. Prior to the plastic bag ban adopted at the 2014 town meeting, the Berkshire Co-op was already charging 10 cents for individual paper bags and money was never the goal. 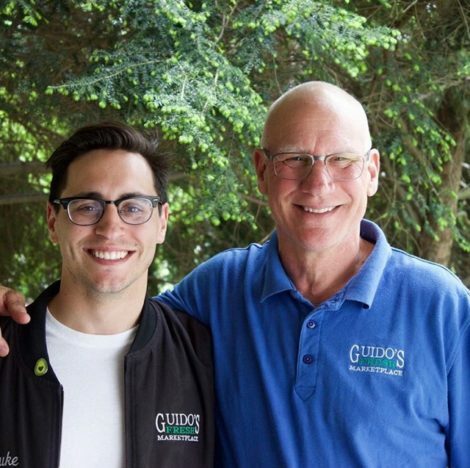 From left, Luke and Matt Masiero of Guido’s Fresh Marketplace. Raising awareness of the proliferation of plastic waste is what Matt Masiero, co-owner of Guido’s Fresh Marketplace, attempted to do at the August 6 special town meeting that had been scheduled to consider a repeal of the plastic water bottle ban. Masiero favors the ban although his business stands to lose about $25,000 in revenue a year. His position is that of a business owner who is ready to adapt by investing time and energy into solutions, rather than lament in the financial losses and initial inconveniences. As it turned out, Masiero, a Richmond resident, did not have an opportunity to present his letter. Moderator Michael Wise wanted to give town residents a chance to voice their views first, and then by the time Massiero’s turn came round again, the question had been called – meaning that a vote had been taken that ended discussion. Click here to the text of Massiero’s letter as it appeared in The Edge. 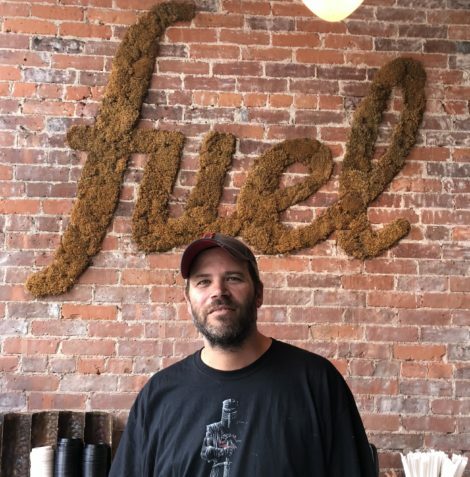 Guido’s plans to be finished selling bottled water in plastic containers of one liter or less by the first of the year, not only in Great Barrington, but at its Pittsfield location as well. Guido’s is replacing plastic cups with composite corn-based containers, which they already offer to customers at a discount and sell to employees at cost. When the ban goes into effect next year, Great Barrington will become the third community in the United States to prohibit the sale of small single-use plastic water bottles. In August 2015, marine biologist Christine Figgener filmed her team removing a plastic straw from a sea turtle’s nose. That video now has over 32 million views on YouTube. This began a movement to eliminate plastic straws that now includes the participation of companies such as Starbucks and American Airlines. Sugarman and Masiero credit environmental documentaries as playing a role in peoples’ current awareness of the effects of plastic on the environment. “Just watch,” Masiero states with passion. “It’s really amazing. 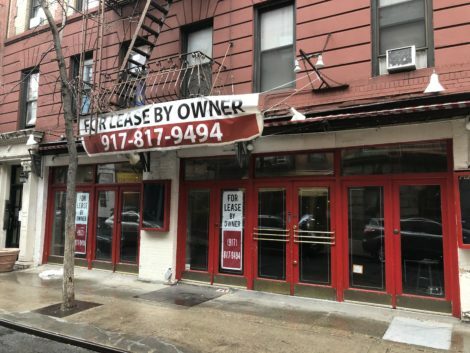 It’ll change your whole outlook.” He then pointed to a monitor at the entrance of Guido’s that has the documentary being screened repeatedly for customers. Happy to see you here Nick, and hoping to see more stories from you like this one! It is very encouraging that the Co-op, Guido’s and Fuel Coffee Shop are moving forward to help our environment. A journey of a thousand miles begins with a single step. Silly idea, in the grand picture means nothing. In the grand picture everything means nothing. I’m going to go jump off the Crown Plaza in Pittsfield. Over 38,000 people commit suicide every year just in the United States. Your insensitive remark isn’t funny. Kudos and thank you to our terrific local merchants for offering water stations. I’d encourage them all to offer tap water rather than spring water, even if from a local vendor. Aside from issues around plastic, it’s very important that we utilize and support our public-water infrastructure, rather than encourage the draining of aquifers here (and around the world). Along with, and related to, climate policy, water and water-use policy is an enormous issue. We must protect and properly/fairly invest in our public-water infrastructure to maintain economically vibrant, healthy, and affordable communities.